When farmers markets are in full swing I love making recipes that really highlight in-season vegetables! My Summertime Couscous is filled with tomatoes, peppers, Persian cucumbers, and roasted artichoke hearts. Then everything is dressed (fabulously!) with olive oil and lots of lemon juice and zest. It’s fresh, simple, and always a crowd-pleaser. The best part, it can be made a few days ahead of time and stored in the refrigerator. Making it ahead of time actually helps all the flavors meld together, really flavoring everything perfectly! Happy chopping! While the couscous is still warm, add all of the ingredients and stir until well combined. Serve at room temperature. For an updated version of haricot vert (green beans in French) with garlic, I chose to use haricot jaune (yellow beans in French) in my super-chic recipe for Haricot Jaune with Garlic. I think these add just the right amount of sophistication to a classic dish without making it seem “too fussy”. They also look so appetizing against a white platter covered in fresh green basil and parsley! This recipe is just as good room temperature as it is right from the stove. You can easily add your own twist to this dish with lemon zest, orange zest, or other fresh herbs. Happy creating! Watch my webisode of From My Kitchen to Yours - Summertime Picnic for a complete tutorial. Start by bringing a large pot of water to a boil. In the meantime, fill a large bowl with ice and cold water. Once the water comes to a boil, cook the haricot jaune for 3 to 4 minutes. Immediately strain the beans and plunge into the bowl of ice water. This is called “shocking” and will stop the cooking process and allow the beans to retain its vivid yellow color. Next, in a 12-inch sauté pan, heat the butter and olive oil over medium heat. Add the shallots and cook for 5 minutes. Add garlic and continue to cook for another minute. Add the beans, salt and pepper and toss to coat evenly and heat the beans through. Transforming one dish into something totally different is exactly how my Strawberry & Goat Cheeses “Hero” came about. I was sitting at a chic little Chicago bistro waiting for the strawberry and goat cheese salad I ordered for lunch, while I simultaneously ate the ENTIRE bread basket that was filled with fresh baguette slices (and butter!). After my salad arrived (and I ate that, too!) I thought I should take the best components of my salad and wrap them in a crusty baguette! Plain and simple, no fuss, just fresh ingredients that all compliment one another. This scrumptious “hero” will take your taste buds up, up, and away! Start by slicing the baguette in half lengthwise. Next, drizzle each cut side with olive oil and honey. Then, spread evenly with goat cheese. Sprinkle evenly with salt, pepper and lemon zest. Add the strawberries to one side and greens to the other. Drizzle evenly with balsamic reduction. Bring halves together and slice in half. Serve immediately or wrap in parchment paper and refrigerate for up to 2 hours. Now that we have all the formalities out of the way, doesn’t that just sound delicious?! I have been making (and eating!) fancy schmancy butters for years. They are all the rage is fabulous bistros and high-end eateries all of the world. They can be made in a wide variety of flavors, textures and even colors and are as simple as chopping, dash-ing, and mixing! Whether you are serving something savory or something sweet, my fancy schmancy butters are guaranteed to add a burst of flavor and a creaminess to anything you can dream up! Three distinct flavors; endless serving possibilities! Place all the ingredients into a small bowl and mix until combined. Cut a strip of parchment paper 4½ -inches wide and place the mixture on the short end of the paper. Roll into a log about 1 inch in diameter, rolling the parchment paper around the butter mixture. Twist ends to close. Chill overnight. Tip: Pairs perfectly with roasted and steamed vegetables, grilled chicken and fish, pasta and toasted baguette. Cut a strip of parchment paper 4 1/2 inches wide and place the mixture on the short end of the paper. Roll into a log about 1 inch in diameter, rolling the parchment paper around the butter mixture. Twist ends to close. Chill overnight. Tip: Pairs perfectly with biscuits, french toast and pancakes. Tip: Pairs perfectly with pancakes, croissants and warm baguette for an unexpected twist for dessert. You can never have too many cookie recipes, right?! I’ve never known anyone to turn down a freshly baked and hot from the oven cookie. My White Chocolate Macadamia Nut Cookies are sweet, crunchy and even a bit luxurious. They are jammed packed with whole macadamia nuts, lots of white chocolate chunks, golden raisins and cherries! Once you try a bite, you’ll be saying “hello lover” to this scrumptiously sinful and downright decadent recipe! Grab your apron, put milk (or champagne!) on ice and let’s get started! These cookies are the perfect offering during a sunset cocktail party with a Côtes du Rhône or flute of crisp Champagne. Of course, they are equally as good with a tall glass of cold milk! In the bowl of an electric mixer fitted with a paddle attachment, cream together the butter and both sugars until light and fluffy, about 5 minutes. Next, add the vanilla, then eggs one at a time, allowing each to fully incorporate. With the mixer on low speed, add the dry ingredients until just incorporated. With a large wooden spoon, gently fold in the chocolate, raisins, cherries and nuts until evenly distributed. With wet finger tips, slightly flatten the dough. Bake for 17 - 19 minutes, rotating once half way through. Remove from the oven and allow to cool slightly. Transfer the cookies to a wire rack to finish cooling. Repeat steps until all dough has been baked. If you have never experienced truffles or truffle butter, you are about to have a culinary adventure in your own kitchen! Savory truffles like the one’s used in truffle butter are a rare and extremely expensive mushroom that is considered to be a delicacy due to its intense aroma and characteristic flavor. They have a firm texture and are most often shaved on top of food before serving, although they can also be used to infuse flavor into dishes, oils, and butters. Truffles are harvested in the wild using specially trained dogs or pigs that are familiar with the very particular scent. Because of their very fragrant and unique flavor not everyone admires them as much as others (like me!). Truffle butter can be found at larger grocery store chains in the cheese department, gourmet food stores, and even online. My Truffle Butter Fettuccine combines just a few, simple key ingredients that help bring out the luscious and elegant aromatics of the truffle. Best of all, it take just mere minutes to prepare making it perfect for weeknight dinners or dinner parties on Friday night! Once you make my version experiment with the addition of other fresh vegetables like sautéed red peppers, yellow onions, and even lemon zest. I always keep an “extra” in the refrigerator for melting and drizzling over popcorn, instantly transforming it into élégant pop-corn salé (elegant savory popcorn)! Happy eating! Bring a large pot of well-salted water to a boil. Add fettuccine and cook according to package instructions for al dente. When the fettuccine has 30 seconds of cook time remaining, add the peas to the boiling water. Drain the pasta and peas well. Immediately transfer the drained pasta into the sauté pan with the truffle butter and tomatoes. Add sea salt, black pepper, Parmesan, and parsley. Toss to coat evenly. Transfer to a large serving bowl and serve hot. Spring is here (I think)! So many wonderful fruits and vegetables are in their prime this time of year, green peas being my number 1 favorite! I love the earthy taste and “bite” they have when perfectly cooked or sautéed. My recipe for Fresh Green Pea Hummus combines simple, fresh ingredients that create a delicious dip with crackers, a topping for tartines or a healthy spread for sandwiches. The flavors are bursting at the seam (or should I say pod)! Going “green” has never tasted so good! In a medium sauté pan set over medium heat, add olive oil, onion, salt, black pepper and red pepper flakes. Cook for 6 - 8 minutes, stirring occasionally. Next, add the butter, peas, lemon zest and thyme. Continue cooking for another 8 minutes, stirring occasionally. Transfer sautéed mixture into the bowl of a food processor fitted with a steel blade. Add the hummus and pulse 10 - 15 times, or until desired texture is achieved. Whenever I am having guests over for drinks or dinner, I always like to start off the soiree with a canapé or hors d’oeurve that will pair perfectly with wine, champagne and mixed drinks. My recipe for Roasted Garlic and Mascarpone Spread is everyone’s “new favorite”! After the garlic has been roasted, it takes on a sweeter flavor and the mascarpone adds the perfect amount of creaminess and tang. Not only is this perfect to serve at a party, it’s also fabulous as a spread on sandwiches or as part of a picnic! Enjoy! Sweet and savory, this simple hors d’oeuvres will set the tone for a sophisticated soirée! Start by cutting ½ inch off the top of each head of garlic. Place each head of garlic in the well of a muffin pan. Drizzle evenly with olive oil, making sure to rub the olive oil into the tops of the garlic cloves. Cover with aluminum foil and bake for 40 minutes. Meanwhile, in a small saucepan set over medium heat, combine the balsamic vinegar and sugar. Allow to come to a boil, then lower heat to a simmer, and reduce to ½ cup. About 15 minutes. Set aside. Next, in a medium bowl, combine the mascarpone, salt and pepper. Using your fingers, squeeze each clove of garlic out of its skin and into the mascarpone mixture. Gently mash the garlic with a fork and incorporate into the mascarpone mixture. Spread desired amount onto thin slices of baguette or crackers, drizzle with balsamic reduction and arrange on a serving platter. The smell of puff pastry baking in the oven is what I would imagine patisserie-heaven would smell like. Now, add Roquefort cheese and strawberry (or fig) preserves inside and you have a delicious, simple, and unexpected hors d’oeuvre to serve to your guests at your next soirée! The beauty with my recipe for Roquefort & Preserves Squares is using frozen store-bought puff pastry, good quality store-bought or home-made preserves. Also, you can assemble this a few hours in advance, leave it in the refrigerator, and bake it right before your guests arrive, et voilà! Preheat the oven to 450 degrees F. Line a sheet pan with parchment paper and set aside. Begin by laying out one thawed sheet of puff pastry on a floured surface. Lightly roll into a 11-inch by 14-inchrectangle. Place it on the sheet pan. Spread the strawberry preserves onto the pastry, leaving a ½-inch border around the entire pastry. Sprinkle the crumbled cheese evenly on the preserves and within the border. 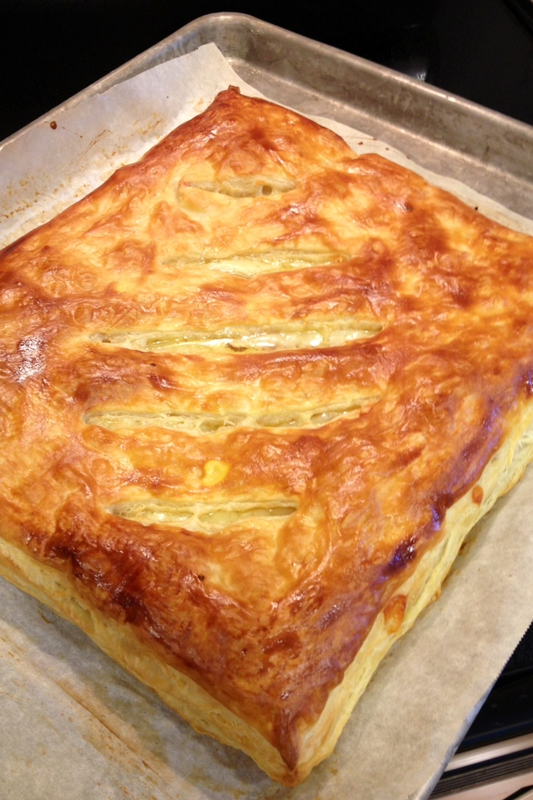 Next, lightly roll the second piece of puff pastry into a 11-inch by 14-inch rectangle, as you did for the first. Then, brush the border of the first pastry with the egg wash. Lay the second pastry square directly on top of the first square, lining up the edges. Be careful not to stretch or pull the pastry out of shape. Brush the top of the pastry with the egg wash, and then cut five slits through the top layer of pastry, for steam to escape. Allow to chill in the refrigerator for 30 minutes. Place into the pre-heated oven and bake for 20 to 25 minutes. Turn once mid-way through the baking time. Bake until puffed and golden brown. Remove from the oven and allow to cool. Cut into strips or squares. Serve warm or room-temperature.